I was just making lunch for the boys and when it was ready they were busy outside on the patio, so I thought I'd leave them play a bit longer before I called them in as they were obviously having fun. Ollie came in 10 minutes later - "come and look at my green stone Mummy", so off I went expecting a heap of stones or general play chaos. I was not expecting a chalk circle, containing a chalk grid, with a slate chipping in each square and the central stone coloured green. This is not a copy of something I had done with them before - this was entirely self directed creativity. Children all have this creativity within them. 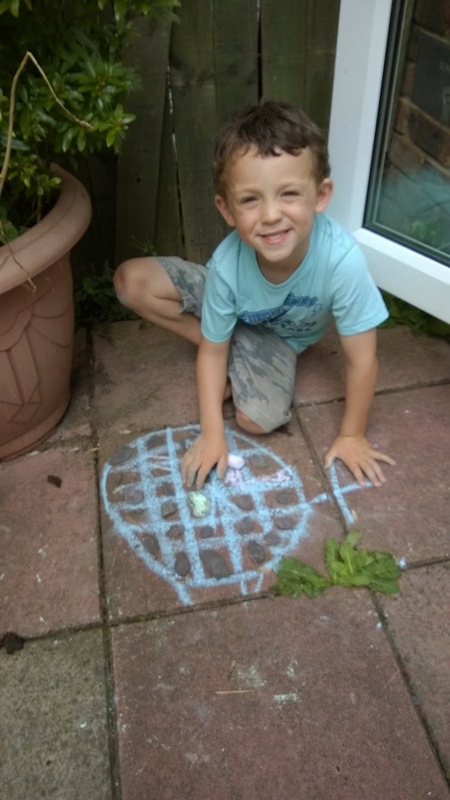 They may have varying levels of conformity to what we would regard as being 'good at painting', but encouragement of an outlet for their creativity is an important part of caring for children. There is a theory within childcare settings at the moment that providing children with pictures to colour in, or stickers, stamps and templates, gives them the message that their own work is inferior and we should therefore only give them free-drawing materials. This seems a bit too far for me since kids tend to adapt any resource to their own ideas - I've never seen a pink crocodile but that's what colour Toby decided to colour the one in his colouring book. Where it becomes a problem is if that is all they have, and if we sit there nagging them to use certain colours, keep inside the lines and so on. Adult artists also tend to learn about the work of other artists and how to use a variety of different media before they go on to develop their own style, and this is true of children too. So the way to grow an artist (in my definition this is someone who embraces creativity and produces something that satisfies their creative thoughts and feelings) is to provide materials, show ways they can be used yourself, and also go and see what other people have produced. 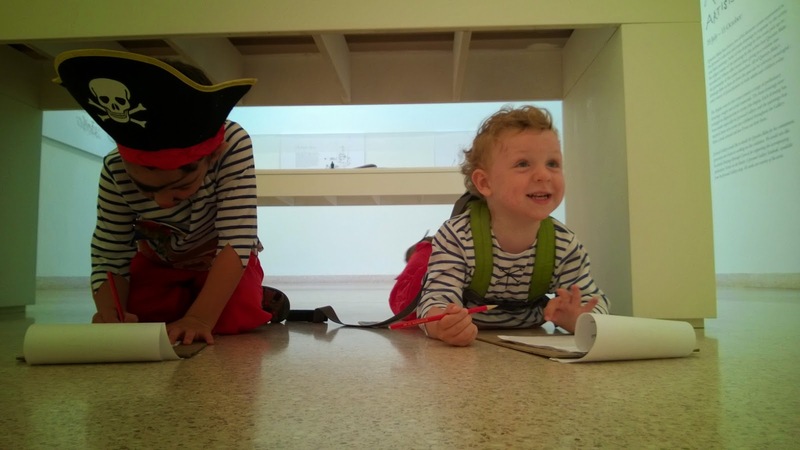 Galleries are a great place to do this, and are increasingly welcoming of children and families. So long as you can keep sticky fingers off the art (unless it is a touch gallery) and they aren't charging around, most Galleries are very happy to see you. The key to these two caveats are vigilance and timing. Feed the kids before you start trying to look at anything, keep their attention by holding them up to a picture in each gallery, saying what you like about it and challenging them to find their favourite and tell you about it, use any resources the gallery provides such as worksheets but don't feel you have to stick to them and do every activity, and keep the time frame small. It is better to look at a couple of things and try out the ideas at home then it is to try to look at everything and then get cross with overloaded children. When I talk about science topics I always say 'if you know the correct terminology, use it' but if you are like me and have more enjoyment of art than actual knowledge then don't feel pressured to look clever in front of other gallery users and staff. Just use the words you think will help to develop your child's vocabulary and reasoning for example comments such as "does that picture make you feel happy or sad? It makes me feel sad, maybe because of the colours the artist used" works for us. On Sunday it was Pirate Day here in Hastings and we used the opportunity to have lunch in the Jerwood Gallery Cafe (the kids love the macaroni cheese on the kids menu) and then see the new Quentin Blake display. 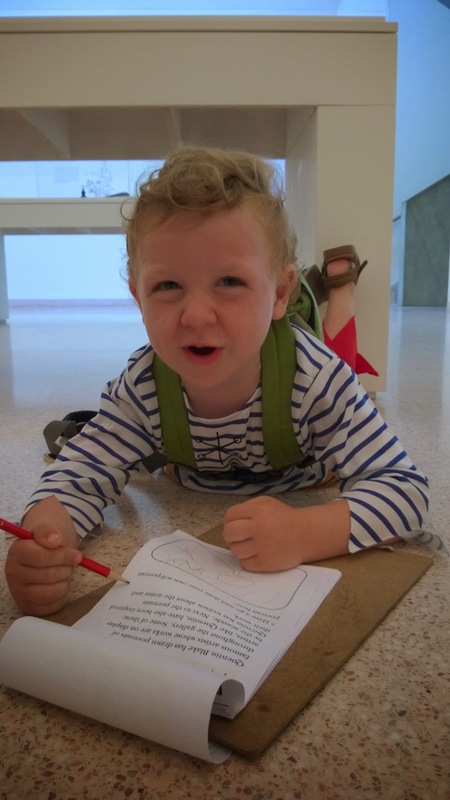 The Gallery provided pencils, clipboards and a new summer activity booklet with things to look for and spaces to draw things for yourself. The boys particularly enjoyed making their own self portraits and lay on the cool floor for a long time, recovering from the heat and crowds outside as well as having fun drawing. 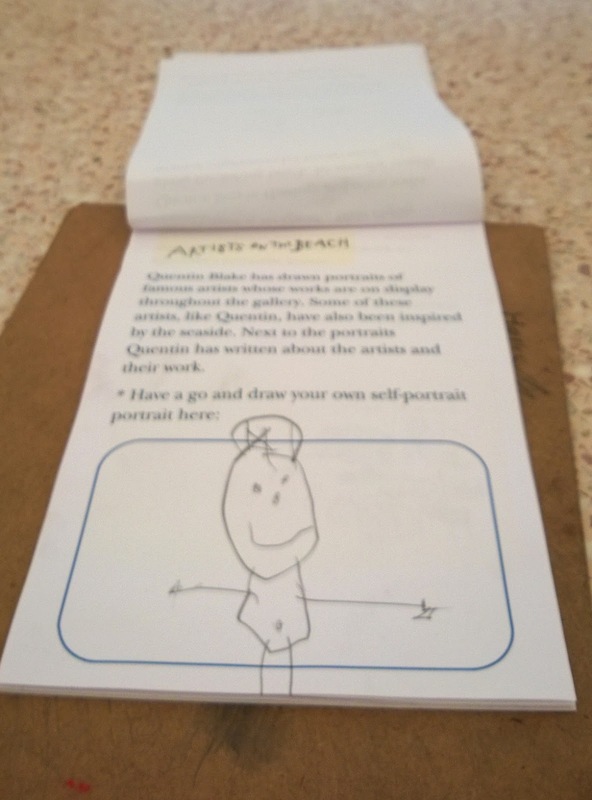 If you are interested in your children learning about specific artists, you could even pick up books from the library and have a go at making something together in the style of that artist, just as Quentin Blake's exhibit explored the artists he has enjoyed looking at himself at the Jerwood.